We've heard plenty about the inevitably of more efficient circuitry in our gadgets as the number of nanometres used to measure their dimensions shrinks inexorably, but Toshiba's R&D unit has excelled itself by developing 10nm processes for the first time. The minute manufacturing techniques apply to flash memory chips that are not quite ready for the big time yet - Toshiba's scientists predicts they're still four generations away - but the know-how and the prototypes are already in the labs. According to the research, something called 'double tunnelling' can create 10nm pathways that allow for densities of over 100Gbits. Safe to say, we're talking here about really huge flash drives within a few years. 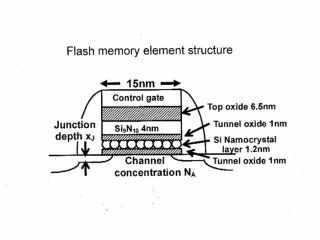 The announcement contains plenty more information on the physics involved, so if you're keen to read about the 1nm oxide films Toshiba used and the full details on Silicon Oxide Nitride Oxide Semiconductors, click on and be our guest.